Scomber japonicus, or the Chub mackerelhas been eaten long by Japanese. 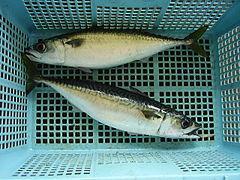 Scomber japonicus is one of Scomber. Japanese eat many S.japonicus every year. S.japonicus in Miyagi is became brand and called “KINKA SABA”. Its name is different from each area. For example it is called Hirasaba in Kochi and Shizuoka, Hirasu in Nagasaki, Takkuri in Kagoshima, Honsaba in some area. Family is Scombriae, genus is Scomber and species is S.japonicus. There are is four varieties of the genus Scomber: Scomber colias, Scomber scombrus, Scomber australasicus and Scomber japonicus. S.colias range from western the Atlantic Ocean and resemble S.japonicus in form. S.scombrus ranging from northern the Atlantic Ocean. S.australasicus have many black spots on belly. S.japonicus resemble S.australasicus in form but it don’t have a black spot on belly. S.japonicus is fifty centimeters long. Their body is slender and ellipse. Their scale is small. Lateral line’s scale is 210 to 220. Back is greenish-blue and black curved lines. Belly is silver and white. S.japonicus live facing warm current of semitropic and temperate water. They like water temperature of 14 to 17 degrees. S.japonicus make cloud and swim surface coast. It travel to north on spring and south on fall. It travel 10km per a day. There are shoal which stay around area of rock too. It eats small fish, zooplankton and cephalopod. The laying eggs season is February to August. They lay eggs which is 1mm across and a number of eggs are from 100000 to 1400000. Many fry are eaten by other fishes because they are not protected by parents. Its life span is 6 to 7 years. S.japonicus is eaten by human all over the world and it become supplement because they contain a lot of DHA and EPA. Its season is fall and winter, but it is bad on summer. When we eat it, we mind Anisakis. Anisakis is worm and finally parasite on mammals. We especially mustn’t eat raw fish. S.japonicus is eaten by people of Kochi, but S.australasicus is more famous than S.japonicus in Koch. It is because in southwest Kochi catch S. australasicus which is called “Shimizusaba” by Tosa. Its season is fall to winter but we can eat all the them year around. It is delicious so it is famous in Japan. S.japonicus are not protected because they are plentiful.